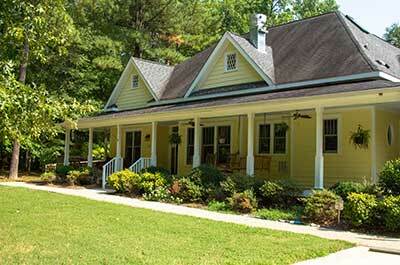 With treatment offered in a farmhouse setting in Durham, North Carolina, and a community-based day program and intensive outpatient center in Raleigh, North Carolina, Carolina House provides high quality care to those who struggle with eating disorders and co-occurring mental health concerns. At each of our locations, we treat individuals aged 18 and older who have a minimum BMI of 13, have a partial motivation to obtain recovery, and who are able to independently carry out daily living skills. With a specific focus on treating anorexia, bulimia, and binge-eating disorder, Carolina House supplies an exceptional amount of therapeutic services to help bring about recovery in its clients. Therapies such as dialectical behavior therapy (DBT), cognitive-behavioral therapy (CBT), acceptance and commitment therapy (ACT), and 12-step programming are supplied to encourage clients to effectively sort through their emotions, and develop a strong footing in recovery. At Carolina House, a staff comprised of a psychiatrist, a physician, licensed therapists, nurses, an art therapist, and registered dietitians help clients put an end to their disordered eating habits and poor mental health. We offer outpatient programs for men and women aged 18 and older at our Raleigh location, where additional therapies including motivational interviewing and psychodynamic therapies are provided. The partial hospitalization program (PHP) is offered to the same demographic in Durham, and provides clients with medication management, individual therapy, family therapy, group therapy, and experiential therapies. To round each level of care provided, Carolina House also offers a spiritual program, interpersonal groups, and yoga and mindfulness exercises for its clients.